UAL Awarding body caught up with Neeraj Kainth, winner of “strongest mixed-media piece” at Origins 2017. I was studying the UAL Awarding Body Graphic Design Level 3 qualification and my lecturers at college encouraged me to submit my final project for the exhibition. My work was titled ‘Privacy Protection’. It addressed how easily we give away information about ourselves online. Through print, animation and augmented reality, it explored the culture of social media and how harmless contact with friends can in fact lead us to give away more information than we want. 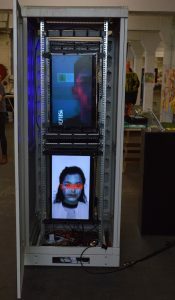 The work was housed in a manipulated network tower; a kind of assemblage of social media and technology. Information for it was gathered through manual and online questionnaires. I think the atmosphere of the event was the most enjoyable thing for me. I loved being surrounded by peers who shared the same passion towards art and design. The location of the exhibition was also brilliant. It was great to know that my work was being shown in proximity to artists such Shepard Fairey and D-face. What was your experience of exhibiting your work at Origins 2018? I had never exhibited work to the public on that scale. At first, I was a bit nervous but the response from people looking at my artwork and the conversations I had with them made me feel really confident and the proud of the body of work I had created. Tell us the most rewarding thing about presenting your work at Origins 2018. The most rewarding thing for me was when my work was chosen as the “strongest mixed media piece.” I wasn’t expecting to win any prizes at the exhibition, but I was overwhelmed to know that my artwork had made an impact on people. I would say go for it, 100% without a doubt. Only good things can come from exhibiting at Origins. I think it is a great opportunity for students to show their skills and passion for their subjects, and it is a brilliant experience for someone who is beginning their art/design journey or are in the early stages of their career. At the moment, I am creating artwork for my end of year exhibition which is exploring the theme of Mass Surveillance through technology. I decided to stay at BMet and I am currently studying HND Graphic Design within the FEED Studio. The FEED studio is a creative learning environment linked to the college, that teaches at an industry standard level and is run like a design studio. I hope to progress to university next year to continue studying Graphic Design when I finish my HND. One of my long-term goals is to work in a design studio and to be a part of the ever-growing design scene in Birmingham. I feel like Birmingham has so much to offer to the world of art/design, and I hope to be one of the young designers from the city to carry out this goal. Click here to learn more about Origins Creative Arts Festival 2018.